Posted by kewlhunter in Apple, cell phone, cool, gadget, Iphone, kewl, mobile phone, tech, Technology, Utilities. I have just added this app and so naturally I had to do a post from my iPhone. I am not that keen on typing a big post this way, as the iPhone just isn’t ideal for that. The app is free which is always a good thing and was very easy to set up and start blogging with. Creating a new post is very easy, as this post proves. The app saves post as an initial draft. I struggled a little to post at first but once I found that ticking published(in status option) by touching it, I had my first from my iPhone post. The app obviously isn’t as comprehensive as publishing from a PC, but looks like all you need to get job done. I will no doubt post then log in later to clean up anything I post this way, like I am now. Posted by kewlhunter in Alpine, Apple, cell phone, cool, Driving, gadget, Hands Free Kit, Iphone, kewl, mobile phone, Music, sound, tech, Technology. I have just installed the Alpine eX-10 into my car. This unit was originally several hundred dollars but is now discontinued and can be found much cheaper. Amazon have it for $US44.95 Click here . I paid a little more as I saw it online cheap and didn’t do any research. At this price its an absolute bargain and there is nothing that comes close at the price or even at 4 times the price IMO. 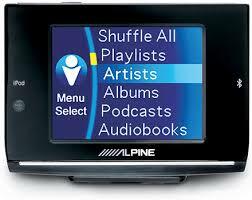 The Alpine eX-10 is a combination of devices. Its a Bluetooth handsfree kit for your mobile phone. Its an Ipod/Iphone interface for your stereo, and it is also a display for both, that can be mounted so you don’t have to take your eyes too far off the road to use it. Posted by kewlhunter in Apple, cell phone, cool, Iphone, Macbook, Music, Technology.